When exchange? It’s a fan favorite question on crypto telegram. 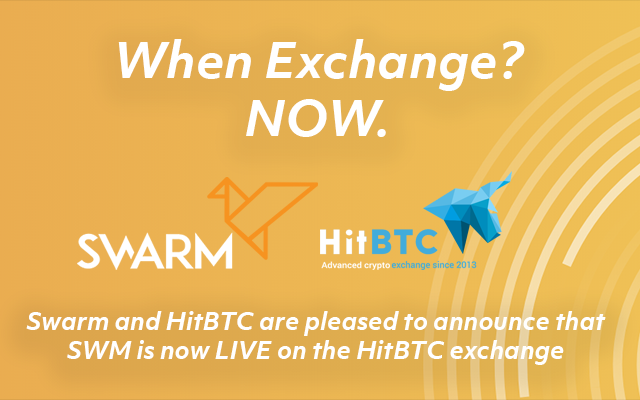 For Swarm, the question has been answered today as the SWM token was listed on HitBTC. While individual motivation behind asking “when exchange?” may differ, it is an important question. It is essential to establish a liquid market for the ecosystem operating on Swarm and exchanging value in SWM. The token must be readily available through many channels, universally accessible to the Swarm community, i.e. investors big and small, fund operators, and service providers. Exchange functionality is key to this ongoing model. This is an important step for Swarm so we wanted to make a brief post about why we chose now to list. The delivery of our product. The development of our community. We have always prioritized product and community. It’s why SWM holders were able to use their tokens immediately following the token sale in our blockchain based governance module. It’s why we launched our alpha product on time in January, making Swarm the first live security token platform. A few weeks ago we released v1.0 of Swarm. It represents our first full release, with all of the necessary infrastructure to automate the utility of SWM in gas, governance, and incentives. Watch for a detailed post on “SWM as Gas” very soon. With our product delivered, and a handful of inaugural funds on the platform, we are ready to shift into the next phase of growth: getting Swarm on the radar of more people, and getting SWM into many more wallets. Listing SWM on top exchanges with large, active investor bases is crucial to growing this community. That’s why our first exchange announcement is HitBTC, one of the highest volume exchanges and a player in the space since 2013. On the regulatory front, we have worked with legal counsel on the lengthy but necessary process of establishing the Swarm token’s (SWM) utility status documented in a memorandum. It was essential to have undergone the right steps to this point and have this document in hand before engaging with exchanges, to continue to stay on the right side of history. Speaking of history, the recent statement from the SEC that ETH is not a security is further validation that we’ve done this right. Simply put, SWM is to SRC20 security tokens as ETH is to Ethereum dapps. Are there more coming? Yes. Can we share which ones and when? Nope. Just know that we’re focused on growing the Swarm community and spreading the word on our infrastructure and the investment opportunities already tokenized on it. Thank you for joining us on this journey. Builder. Investor. Speaker. Globalist. Ginger. Big fan of emerging technologies. Swarm. Formerly Facebook, Federated Media, Meebo (Google).